The Spracklin family married into the Goss family. Spracklins are from Somerset in England. John Andrews Spracklin immigrated in 1817 with the Wine and Anne Rood family (his aunt) and settled in Washington Co., Ohio. There John A. Spracklin met and married Lydia Goss, daughter of Solomon and Olive Scott Goss. John and Lydia had a son named Daniel D. Spracklin and he married Elizabeth Keller in Morrow Co., Ohio. They had four children: Henry, Oliver, Mary and Amarilla. Only Amarilla and Henry survived to adulthood. Elizabeth Keller Spracklin, my great great grandmother, died in 1859 several months after the birth of Amarilla Spracklin (later Barclay) my great grandmother. Daniel remarried to Sarah Blacketer Allgood in 1863 in Iowa where he had migrated to from Knox County, Ohio. He and Sarah had 7 more children: Lydia, Virda, Reed, Daniel, Peter George, Charles Edward, Alfred Marion. Alfred died young. 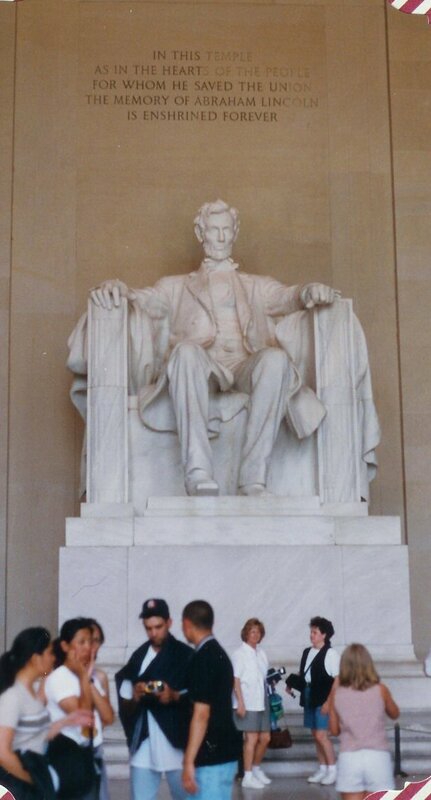 On Saturday June 4, 2011 while still in the D.C. area I met with a descendant of Peter George Spracklin. She is a perfect Half 3rd cousin. Peter George is a 1/2 brother to my Amarilla. I now know three cousins from this side of the family. So about 10 am on Saturday, I got into a taxi at the Gaylord National Hotel south of D.C. and headed into D.C. We were scheduled to meet at 11 am. Well…everything went really well and I was looking forward to being dropped at the American History Museum on Constitution Avenue but….Guess what? The National Mall was overwhelmed in PINK!!! It was the RUN FOR THE CURE and streets were blocked off. My taxi driver let me out at L’Enfant Metro and I had to walk. Fortunately, it was not too hot or muggy…yet! It was fun to walk along and observe ladies and men in different combinations of T-shirts in white with pink, pink with white and more. Some had numbers on them. Here I was in total black!!! Hmmm…??? It was truly showing the power of women. I was humbled. My mother died of colon cancer that had decided to take over her liver back in 1984. She was 74 years old and had a good life but still! I now how terrible this disease can be. There were huge billboards with the map showing the route and water stations. This photograph shows the participants heading for the finish line. I walked quickly heading for the American History Museum entering into the cool foyer a pleasant place to wait for my cousin to arrive. Would I recognize her? Well, she beat me to it and saw me at once! I gave her a descendants chart of our common ancestor Daniel D. Spracklin and a family group report of her great great grandfather Peter George. We happily chatted away about genealogy. 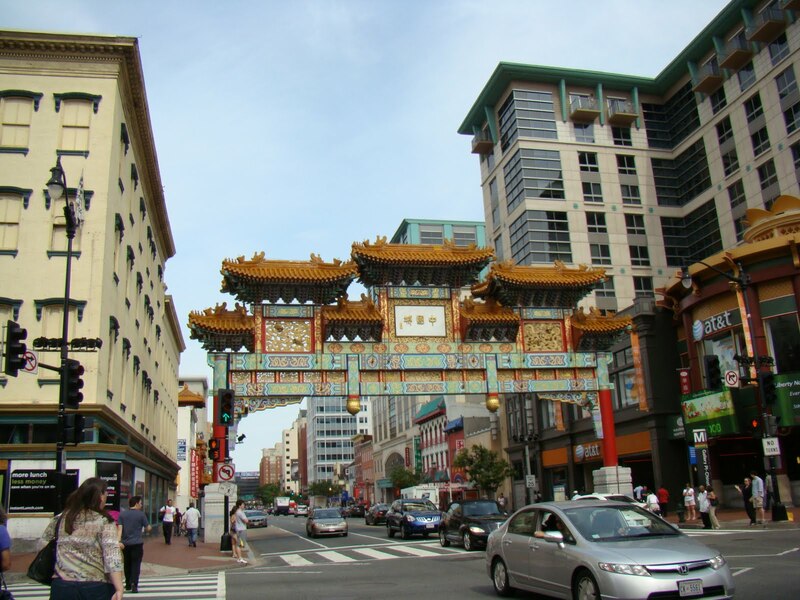 She had decided that it would be fun to go to Chinatown and I was willing. So we figured out how to get a taxi on 7th and headed to the Ming Restaurant. It was very nice restaurant and we took a table by the window. I told her about my life and family first. A lot of girl talk! She told me about her family and of course I wrote it down. Lunch was fun! I am always blow away by the stories of another’s life and the similarities of experience but yet the different choices. My cousin was being born when I was a silly teenager having Hawaiian luau parties in the 1960’s. After lunch we wandered past the Chinatown arch and found a Starbucks on the corner. Just like home! We decided to get some coffees and I staked out some stools. We spent the time lingering and talking some more about life and experiences. We did some people watching as well for it was a busy street corner and a busy Starbucks. Now you are probably wondering if I had a list of questions to ask her and had prepared oral interview. I had some ideas but I decided I wanted to just let the conversation flow. I think I made the correct decision. Now I am not a big talker so these kinds of conversations are a bit challenging for me and take concentration. Apparently my cousin was trying to absorb as well so it was good that the conversation just flowed for our first time together. It was about 4 pm and I had an idea that I could visit, at the very least, the Rotunda of the National Archives and view the Charters of Freedom before heading back to Gaylord National Hotel south of D.C. So we walked along 7th Avenue noticing the shops and architecture. We parted at the line waiting to get into the National Archives with several hugs. I told my cousin about a curious thing that happens when you get involved with the genealogy of your family. It is the fact that you build new friendships when you reach out to your cousins. You rekindle relationships that are lost. I had not seen a McDonald cousin in 25 years but reconnecting with her has been priceless. I had the good fortune to visit my 87 year old cousin and get to know her before she past. You grieve with them when the loose someone dear to them. You rejoice when you surprise a cousin who doesn’t know you yet by acknowledging their contribution and they didn’t even know they had touched your life. HA! It was a lovely day. I have the best cousins!!! 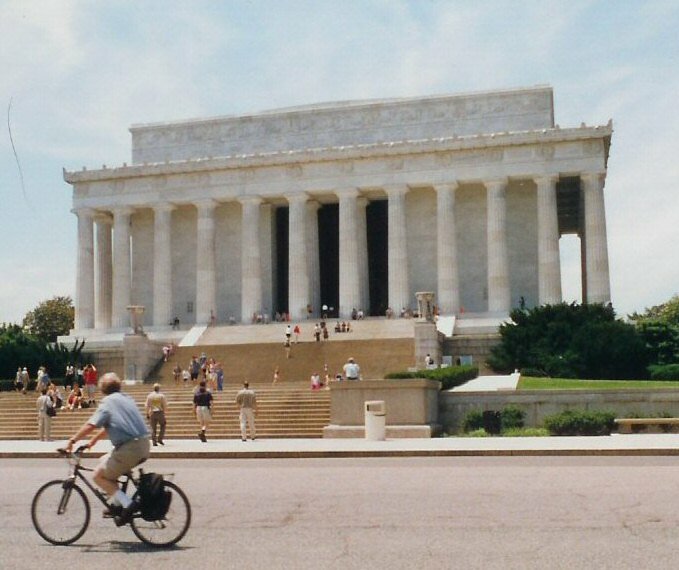 If you ever have a chance to travel to our nation’s capital…GO! It is an amazing place with many many adventures. 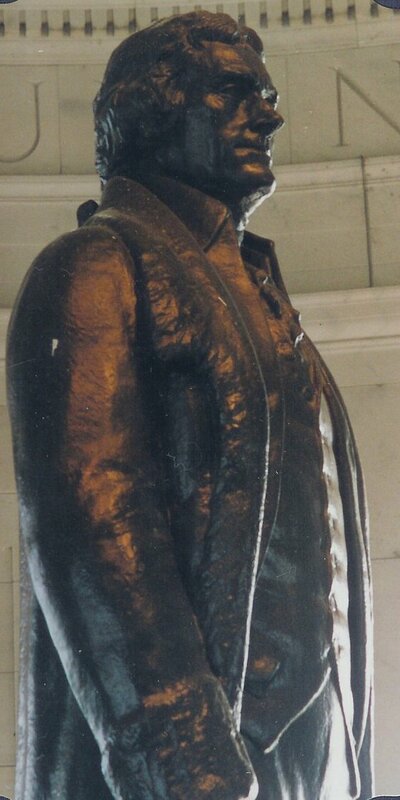 There are monuments like Abraham Lincoln’s pavilion or Jefferson’s Memorial. Both have small displays in the basement and of course a gift shop! You can even go up into the Washington Monument – the Obelisk and look out on the city. Memorials to visit to pay your respects! There are museums to examine and dally in. Just hop on the trolley, pay your fee and take the tour or the loop to all the sites. You can hop on and hop off and get various passes for a day or several. Walking can be a bit daunting…! 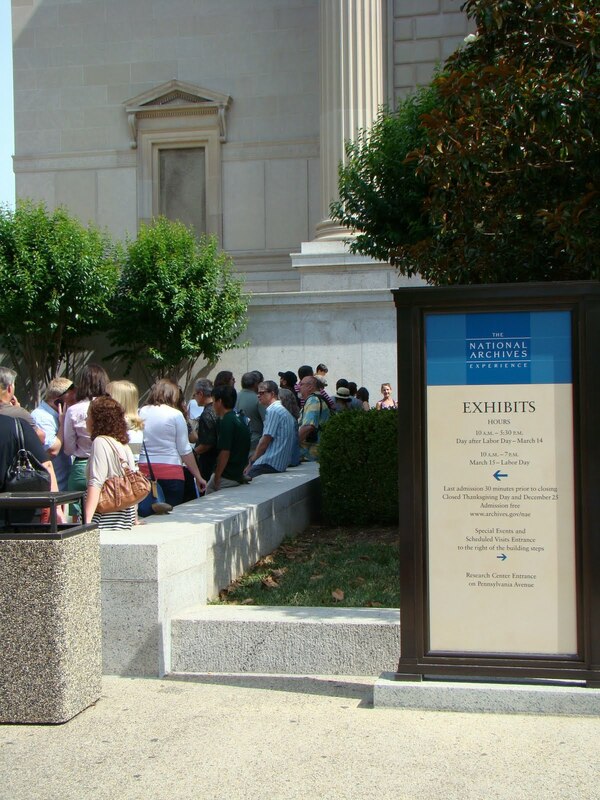 The Smithsonian is a group of museums and you could be exploring for days…. There is the nation’s Capitol to visit or the U.S. Supreme Court. The White House has a tour which you make your plans with your local Senator office months in advance and give a little information about yourself for security reasons. I am planning to go this time. Here is an example of what your local Senator might have on their website and other links to other tours. 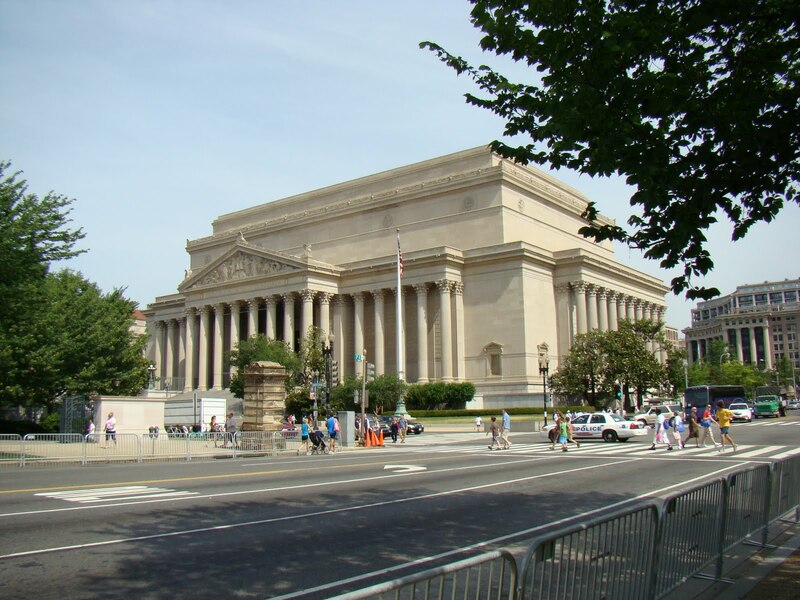 Then there are the other amazing places to go like the DAR Library, the Library of Congress and the main National Archives. As genealogists we can’t go to DC without at least doing some research in one of these locations. Don’t forget that Washington DC has their own vital records and town hall. 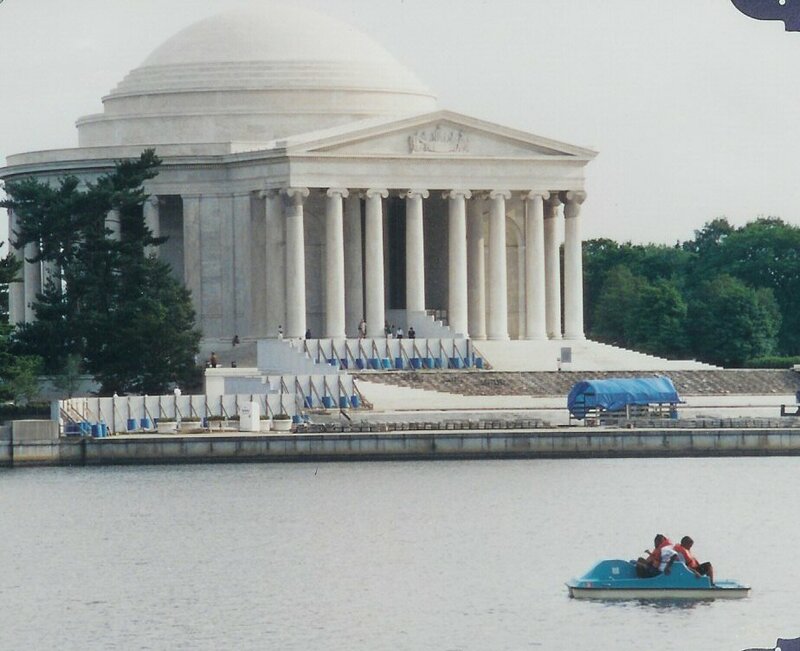 Washington DC is bigger than just the District of Columbia in terms of genealogy. So if you do research specific to D.C. you will need to consider the counties that touch it! Me at the DAR a couple of years ago! 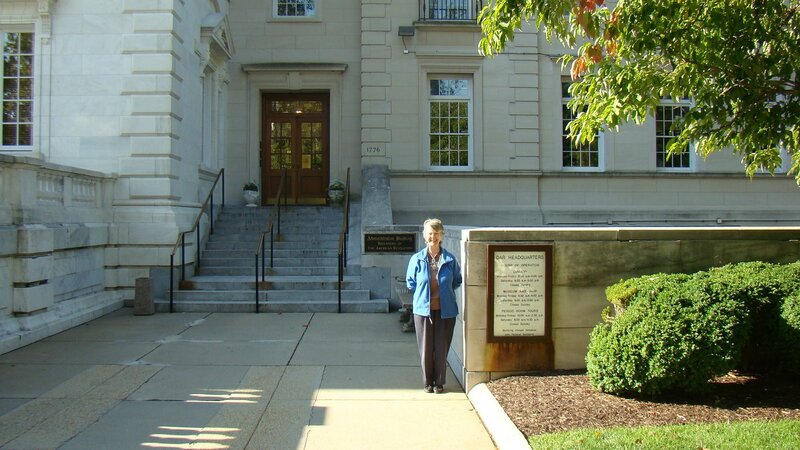 ﻿If you have anyone in your ancestry who could have been involved in the American Revolution than you have to go and visit the DAR library. I have been their 2 times and it is wonderful. They have placed a lot of their holdings online and are going digital now. http://www.warnertheatre.com/ We saw Terri Hatcher there in Cabaret before Desperate Housewives. She is tall, thin and she did a good job stepping into the Liza Minnelli role. http://www.phillipscollection.org/homepage.aspx I wonder if they still have the Boating Party by Renoir? It is wonderful and much larger than you think! I will let you know. SIIM http://www.siimweb.org/index.cfm?id=6934 This is pretty technical stuff to understand. I preferred the original name of SCAR. We will be there soon at Gaylord National http://www.gaylordhotels.com/gaylord-national/ This could be interesting. The reviews are either they love it or hate it!